Saturday, April 15th, the traditional Tax Day in the US, saw thousands of people joining the Tax March in cities across the country. Demonstrators were calling for President Donald Trump to release his tax returns and make them viewable to the public. He was the first major party candidate in decades to not release his returns during the election. During the election, he said he was under an IRS audit and couldn't, that he was advised against it by his lawyers. Now that he is elected, he has said that the public doesn't care. Protesters gathered in Philadelphia to show the president that they do care. Around 2,000 people first gathered at Thomas Paine Plaza across from City Hall for a rally. They then marched down Market Street to Independence Mall. 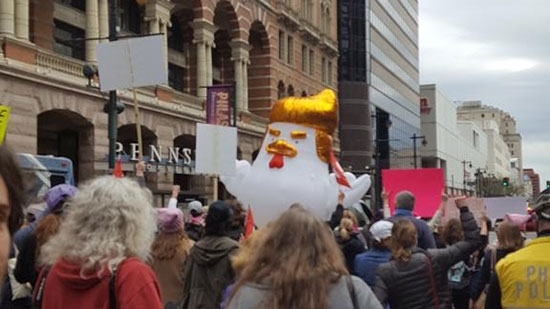 They were led down the street by a giant inflatable chicken that was made to resemble Trump. The design comes from China and similar roosters led marches today in other cities like New York and Chicago. The crowd was met with more speeches and a rally at Independence Hall. Several states have legislation introduced that would require candidates running for president and vice president to disclose federal tax returns to be included on the ballot including Pennsylvania and New Jersey. Police say that a person is custody after a grandmother and grandchild were hit while crossing the street in Upper Darby, Delaware County on Saturday afternoon. It happened after 1:30 p.m. near 69th and Market streets. A man on a dirt bike drove through the intersection and hit the two in the cross walk. He immediately carjacked someone else and drove off. The 6-year-old child was taken to Children's Hospital in serious condition. The grandmother was taken to Penn Presbyterian Hospital in stable condition. The carjacking victim was not hurt. The suspect made a brief getaway and ditched the car before running into a wooded area. Upper Darby Police Superintendent Michael Chitwood said, "The operator of this motor vehicle gets off, pulls a knife out, carjacked a vehicle then takes off. We have the vehicle in Cobbs Creek Parkway." Philadelphia Police were out looking for illegal ATV's and dirt bikes. They tried to pull this individual on the bike over but stopped after a brief pursuit and he continued into Upper Darby. The Tower Theatre was having a family matinee show and many people were in the area walking to the theater. Police are looking through surveillance footage for more information. UPDATE: Authorities have arrested 32-year-old Caliph Douglass of the 1700 block of Ringgold Street in Philadelphia. He is being charged with robbery, aggravated and simple assault, fleeing police, causing an accident involving personal injury and driving with a suspended license, and other offenses. Douglass was arraigned on Sunday at Crozier-Chester Medical Center. He suffered a spinal injury and collapsed lung from the crash. A Rowan University police officer was involved in a pedestrian accident Saturday night. It happened around 10 p.m. Saturday on the 300 block of Mullica Hill Road in Glassboro, NJ. The officer had pulled over a vehicle when he was struck by another vehicle. The second driver did stop at the scene. He was taken to Cooper University Hospital in serious condition. UPDATE: Officer Russell Comolingo has been identified as the victim in the accident. He is a 5-year-veteran of the Rowan police force. He had made a routine traffic stop, got out of his vehicle, and was talking to the driver when he was struck. The other driver did stop. No charges have been filed. Comolingo suffered cuts to his face and a broken facial bone.